SKILLET Announce Second Leg Of US "Unleashed Tour"
2016 is proving to be a milestone year for SKILLET and 2017 is shaping up to continue the trend. 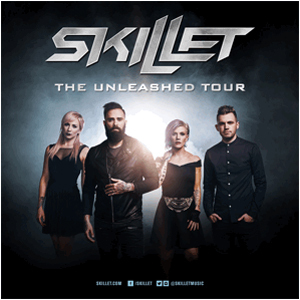 Coming off the band’s most successful European headline run to date that included numerous sold-out performances, SKILLET will embark on the second U.S. leg of The Unleashed Tour. The 26-city tour will kick off on February 8th in Clifton Park, NY and will make stops in Philadelphia, PA; Spokane, WA; Los Angeles, CA and Denver, CO to name a few. The tour wraps on March 24th in Little Rock, AR and is a continuation of the band’s celebrated U.S. run that wrapped up last October. SICK PUPPIES and DEVOUR THE DAY will be support on these new dates. An exclusive presale for The Panheads (The Official Skillet Fan Club) will go live on Wednesday, December 14th. Tickets and VIP Packages including an opportunity to meet the band will be available and fans can sign up for the fan club at: http://www.skillet.com/become-a-member. Public on sale for all shows will be Friday, December 16th and ticket links can be found at: http://www.skillet.com/tour. SKILLET will be touring in support of their latest album Unleashed. The 12-track album is available via all physical and digital retailers nationwide. The debut single “Feel Invincible” recently went to #1 on both the Active (Mediabase) and Mainstream (BDS) Rock charts. The video for the single has been viewed over 21 million times on YouTube and streamed over 16 million times on Spotify.